I remember a years-old quote from Whitney Hess that shed some new light on my role as a User Experience Designer. If all you want to do is protect the consumer, join the ACLU. A true user experience designer understands their company’s goals just as deeply as they understand their constituents. That allows you to determine which of the constituency’s needs should be addressed by the product, and make a case to the powers that be how doing so will positively impact the business in the long run. It’s not even a revolutionary idea. If the business needs aren’t met, the business ceases to exist and that’s sure-fire way to fail the user. 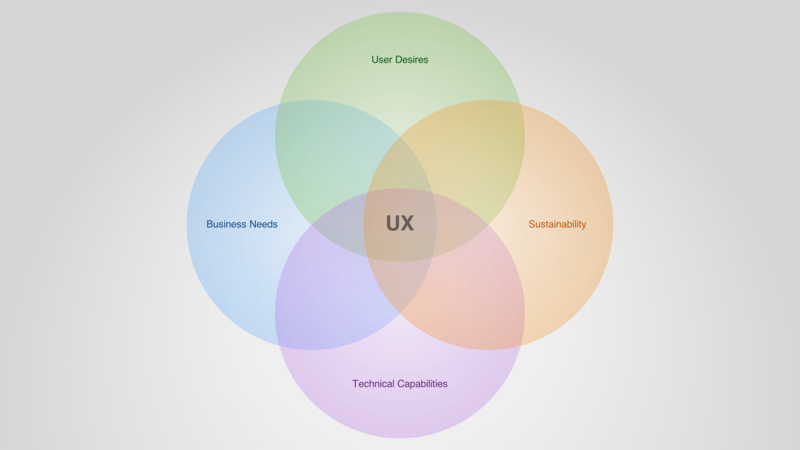 Mind-blowing or not, it lead me to ask new questions, to understand business strategy in a new light and generally made the work I was doing better by understanding that UX is the balance of the business needs and user desire. It wasn’t long after that revelation I realized there was a third leg–What are we capable of doing? Eileen Webb’s post Evaluating Ideas takes this idea a rational step (or two) further. She’s uses an enhanced version of this model to help brainstorming exercises stay within the realm of reality. Brainstorming is fun! In the early days of a new project, there are tons of ideas flying around, and those ideas spark discussions that spark more ideas. I’ve found that what works best for me in these whittling sessions is to have a framework to fall back on. An established framework means that no one is trying to justify their idea to me; all ideas are evaluated in a relatively emotion-free setting so we can decide which solutions are the best ones to pursue. This framework shows the best ideas come at a four-way intersection of user wants, business needs, what’s appropriate for the website and what’s sustainable for the org. Looking back at my my lightly-vetted model, the sustainability piece was a clear miss. A few tweaks later, a slight twist to the diagram (balance or not, the user should be on top!) and clear thanks to Eileen, we have my new model for thinking about user experience.